Today Fizz and I were tasked with fetching the sheep down from the top field. A well trained sheepdog is such a joy to watch. If Fizz understood every word that I said she would still do the exact opposite. That is her impish sense of fun and playfulness. In this video I am employing a different sort of connection and half a loaf of bread. Well it works just the same. Having kept her on the connection for the first half hour I then had to take her somewhere else for a bit of exercise. Here is a short Robin update. I am pretty sure that my (soon to be) tame Robin is a male. The male and female European Robin look just the same and you can’t tell them apart by appearance but they don’t always act the same. This Robin always takes two worms and then he flies off. He eats the first one. Yesterday when I made this video I was surprised to see him almost a full minute after he had taken the second worm, he still had it and he was flitting around with the worm in his beak and he was managing to sing. Eventually he disappeared under a car with another Robin. I think that he is taking the second worm as a gift and that he is courting and that would make him a male. I will need a lot of worms when they are raising their brood. There was a short moment in February when she looked almost pristine but you had to be quick to catch it. 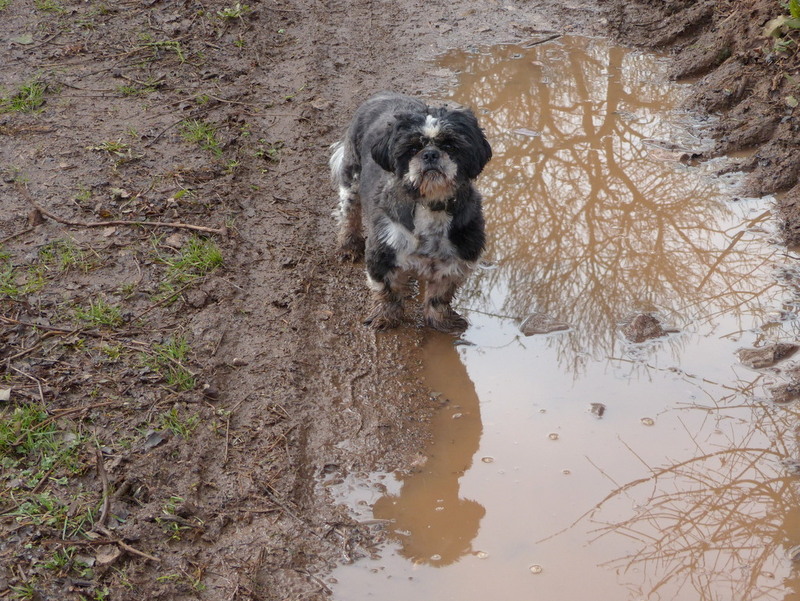 She is by nature a mucky pup. 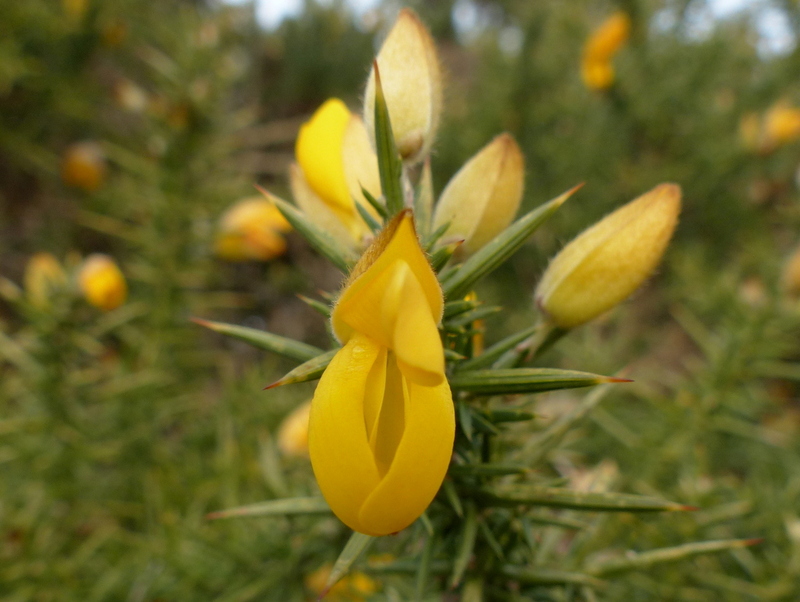 Gorse is flowering nearby and it isn’t on Easy Wildflowers yet so yesterday I went out to collect some pictures. 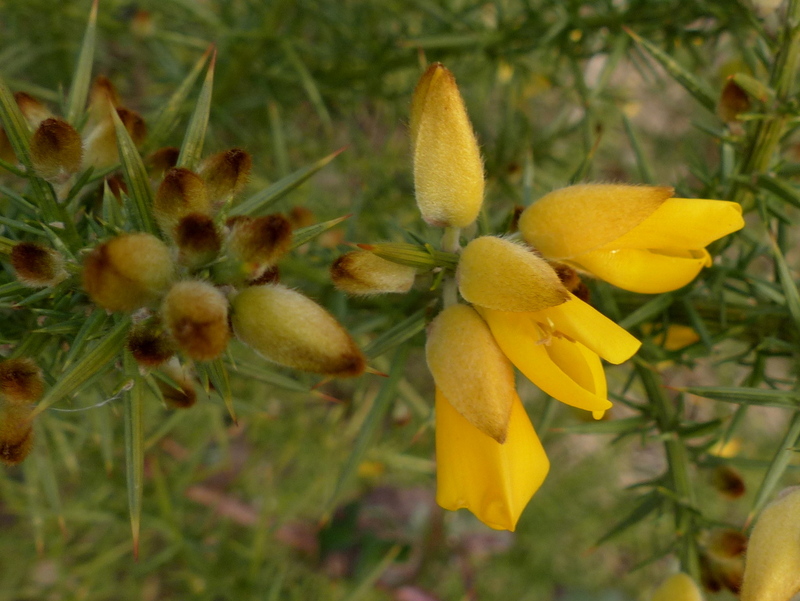 I don’t want to spoil you too much because Gorse will probably feature in my next post but it looks like this. One last little Robin update, this video was made just a few minutes ago. 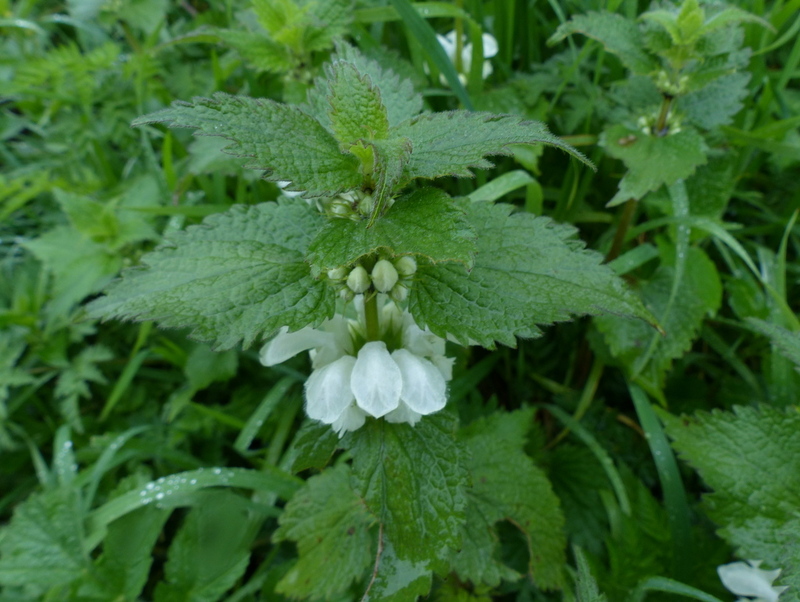 Description: It looks like a stinging nettle with white flowers. 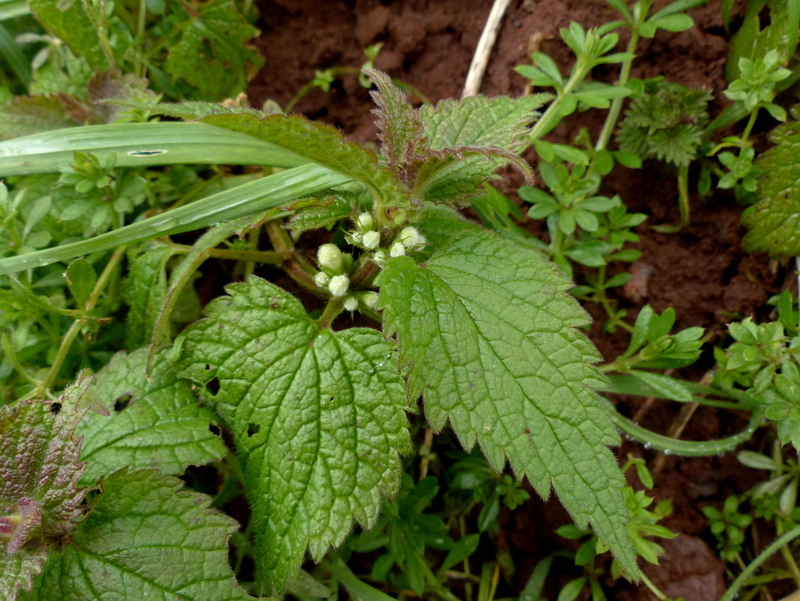 That is a reasonable description, it does look like a stinging nettle but the two plants are not related. 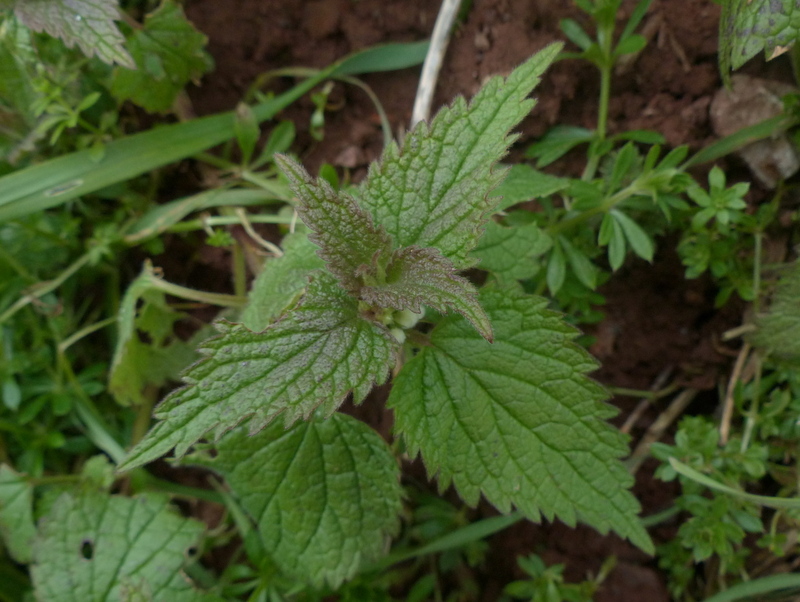 Urtica dioica, the Stinging Nettle is a member of the Urticaceae or Nettle Family and White Dead-nettle is a member of the Mint family. 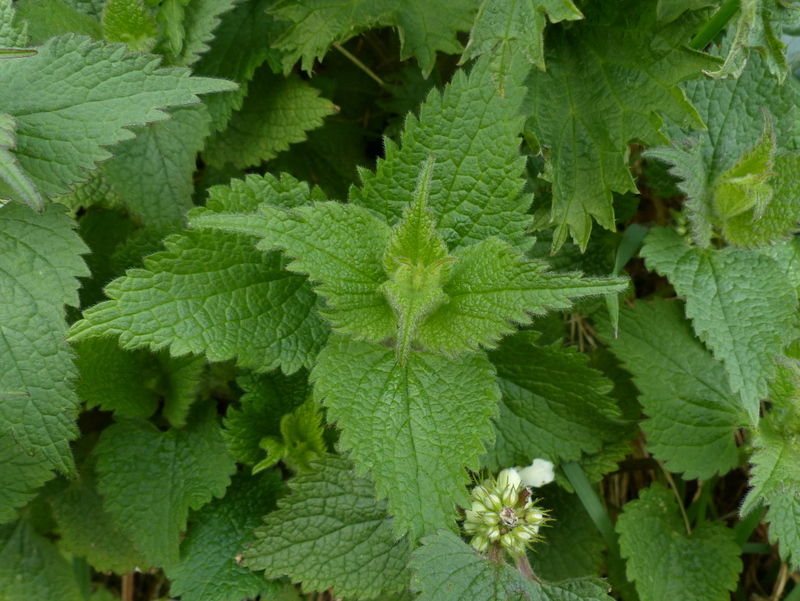 Unlike the Nettle family the Dead-nettles don’t have a sting. You can’t really confuse the two plants, the flowers are the give away and they start to form almost as soon as the plant appears. 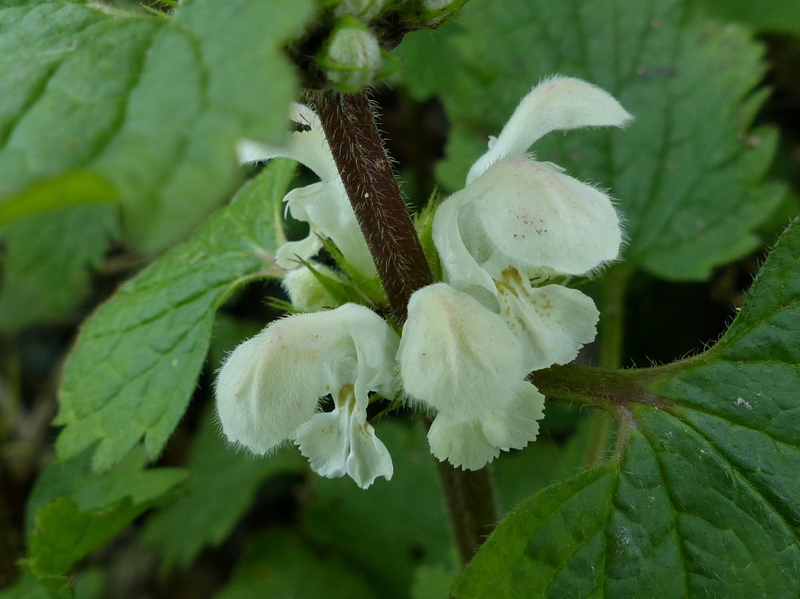 Like other Dead-nettles Lamium album has a square stem. The leaves grow in opposite pairs. 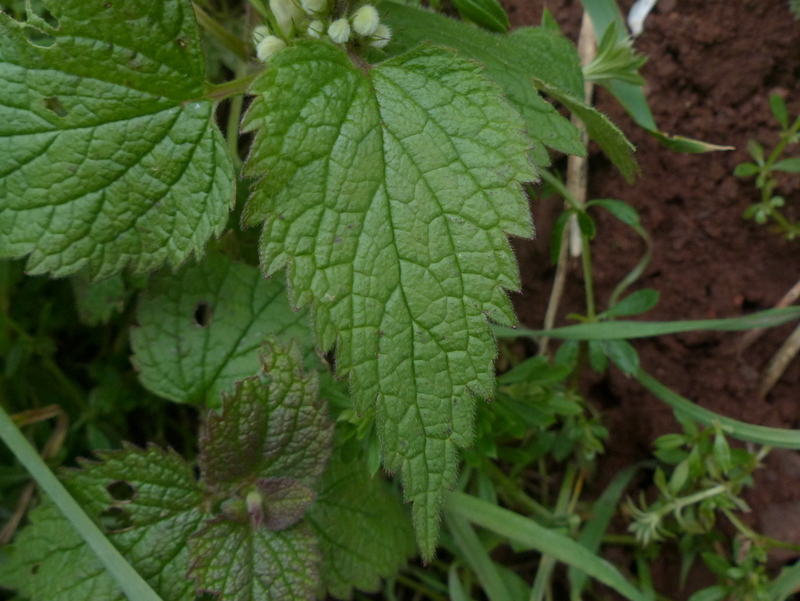 The leaves are described as cordate (heart shaped) to ovate (oval with a tapering point). They are deeply veined with a net pattern and the edges are toothed. They are also covered in soft hair on both sides. 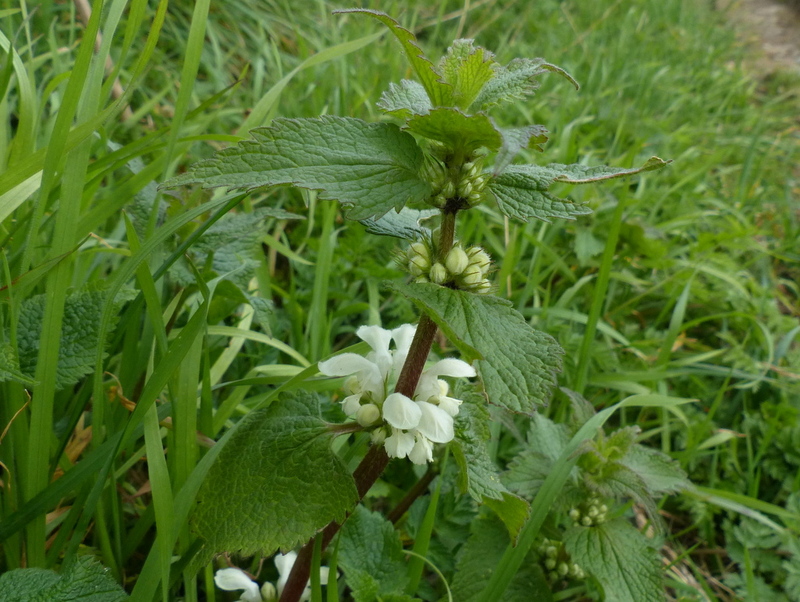 The flowers grow in whorls around the stem and above a pair of leaves. 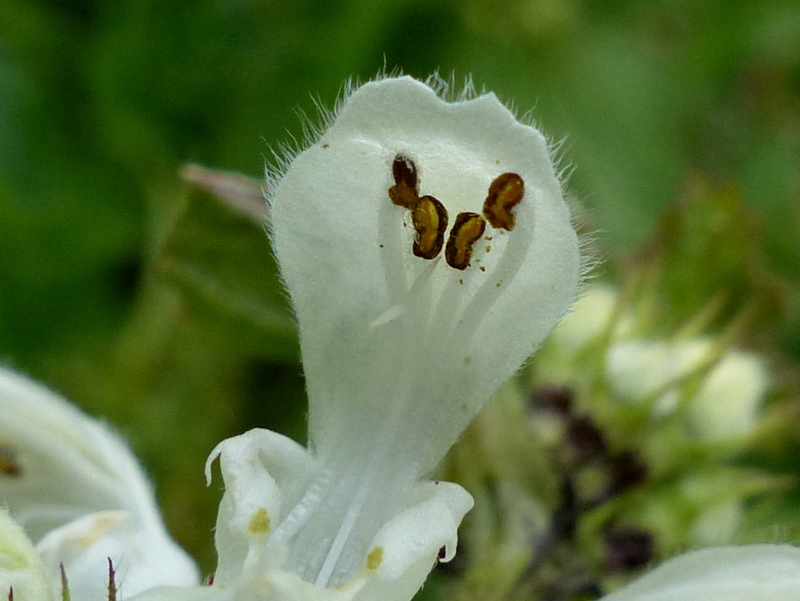 The flower is tubular, opening up to a hood and a three lobed lower lip. 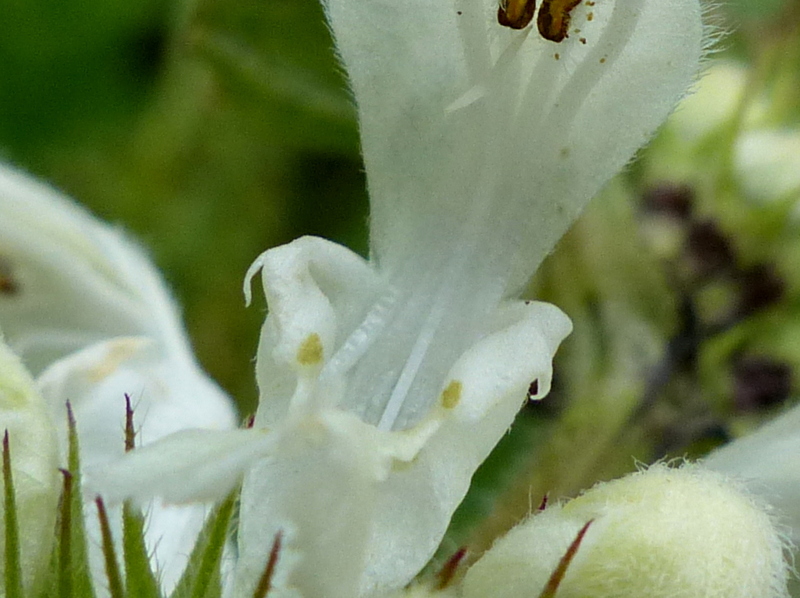 Under the hood are four Stamens, two long and two short and just below the anthers you can see the white style with a two lobed stigma. 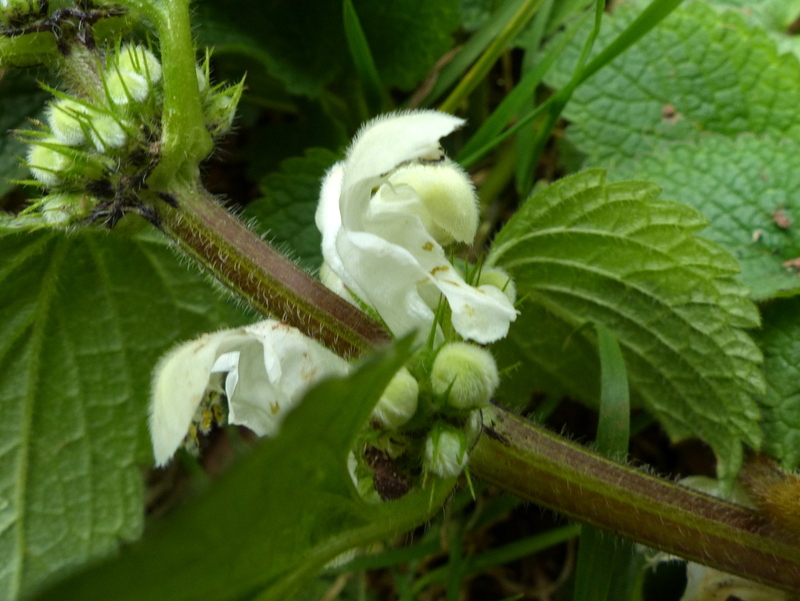 The White Dead-nettle is described as having a three lobed lower lip, It has a large central lobe, the two outside lobes are the very small tooth like projections either side of the central lobe in this next picture. They are fairly insignificant. 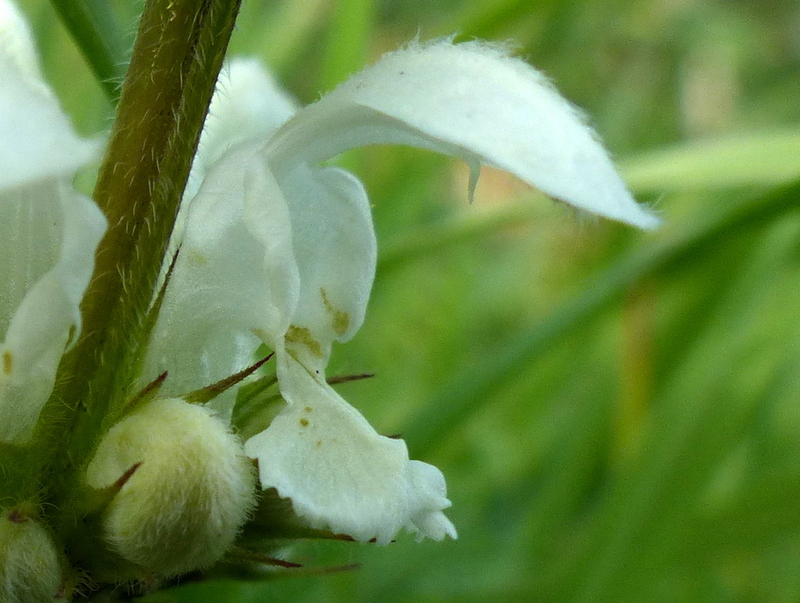 The white flower has small green markings at the centre of the bottom lip. 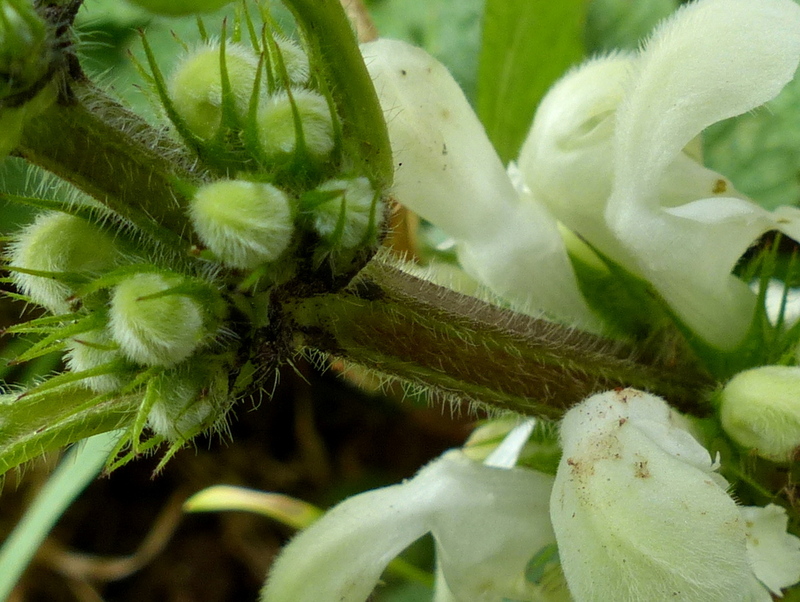 Newly emerging flower buds are protected by a five pointed calyx. 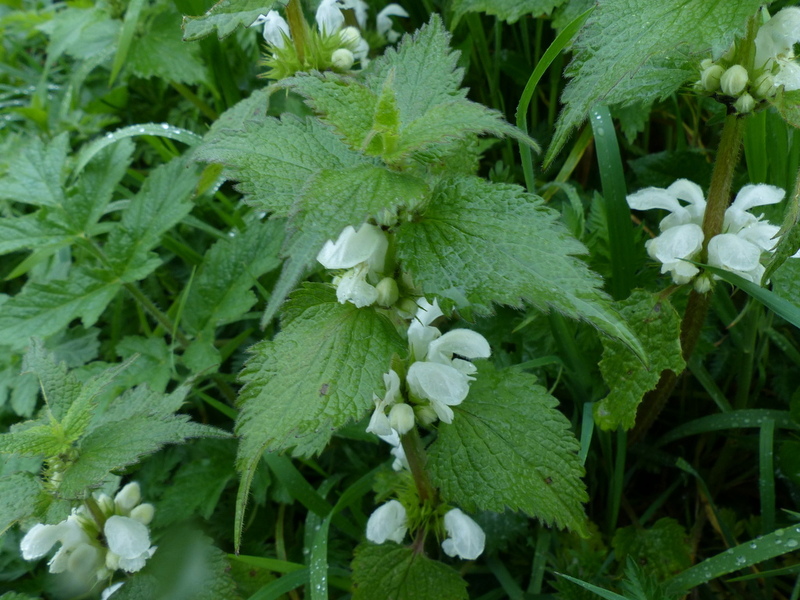 White Dead-nettle is native to the UK, Europe and Asia and naturalised in many other parts of the world. 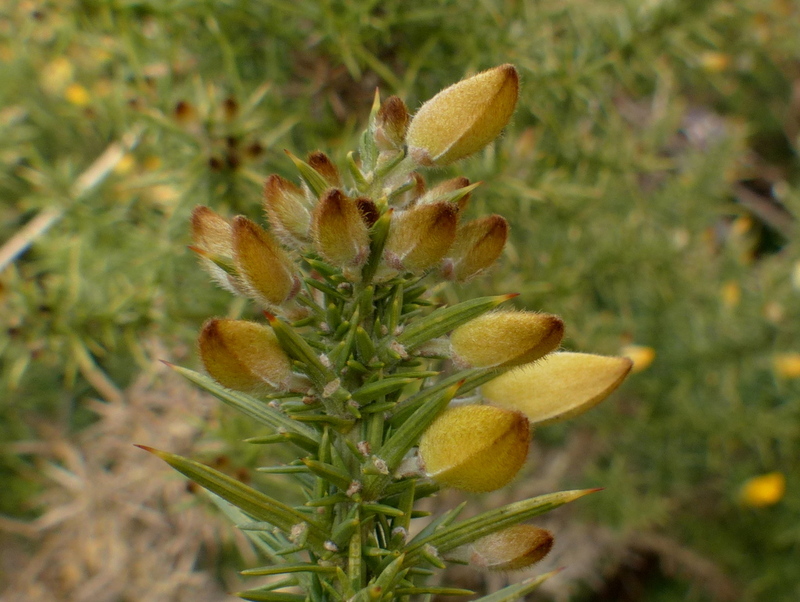 It is a valuable wild life plant providing a good source of nectar early in the year. 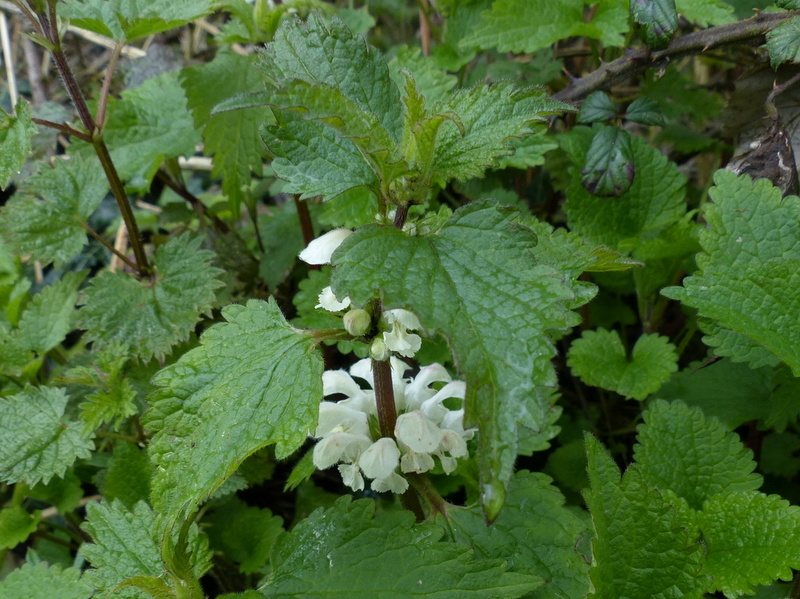 It is very popular with bees and is sometimes known as the Bee Nettle. 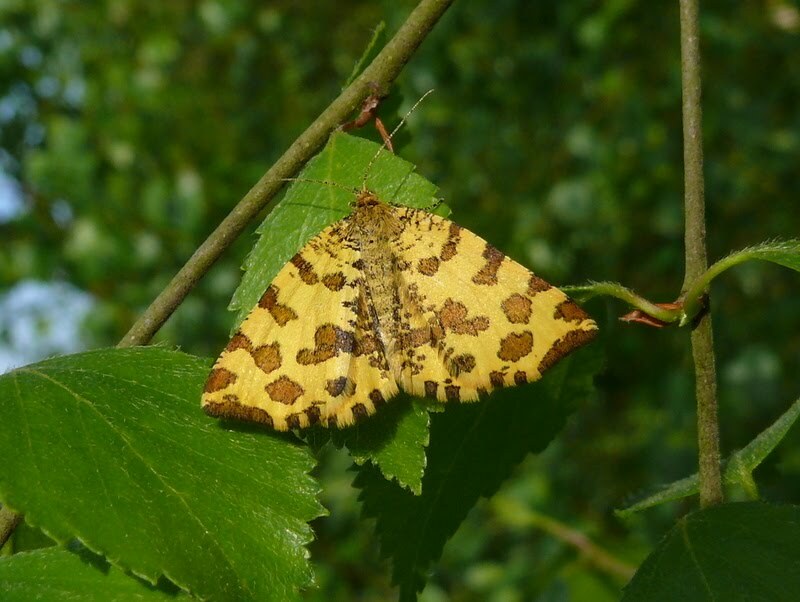 It is the food plant for a number of beetles and moths, including the Golden-Y Moth, the Rivulet, the Burnished Brass and the Speckled Yellow. 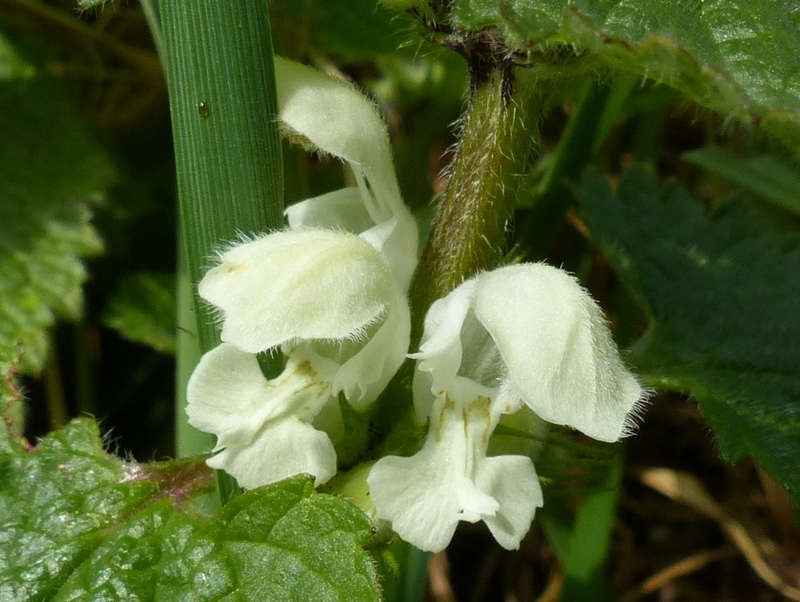 White Dead-nettle is edible. Only the youngest leaves are good to eat raw in salads. 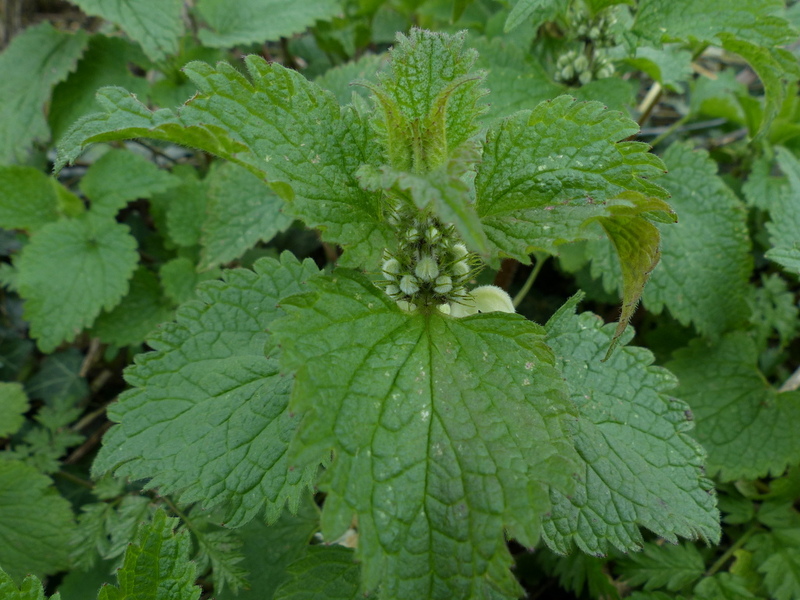 Once it starts to flower leaves can be steamed or added to soups and stews. See, I’m here 🙂 Robin is such a handsome little guy! Thank you Stranger 🙂 I don’t normally go touting for “likes” but I felt an exception was called for in your case. I know that a few of my readers will be pleased to see your comment here. Anyway, I hope that you had a nice time in hospital and the food was better than it is here. I hope that you make a speedy recovery now but take as long as you need, just don’t be a stranger 🙂 and just one eye? Can I call you Patch? I’m a real pirate now 😊 thankfully not for too long, just a few more days. The food was… Well, I lost weight – so just guess about the food. I’m glad to be back, stranger or not, I’ll work my way up to the top again. I enjoyed the video and the photos, especially the wild glowers. Of course Fizz steals this show. I’m glad you included a shot of her fresh from the beauty parlor. Thank you Dan 🙂 Normally I correct obvious little typo’s but I am not sure that you didn’t mean to write “glowers” those Gorse flowers do appear to glow 🙂 You will never see Fizz so clean again. 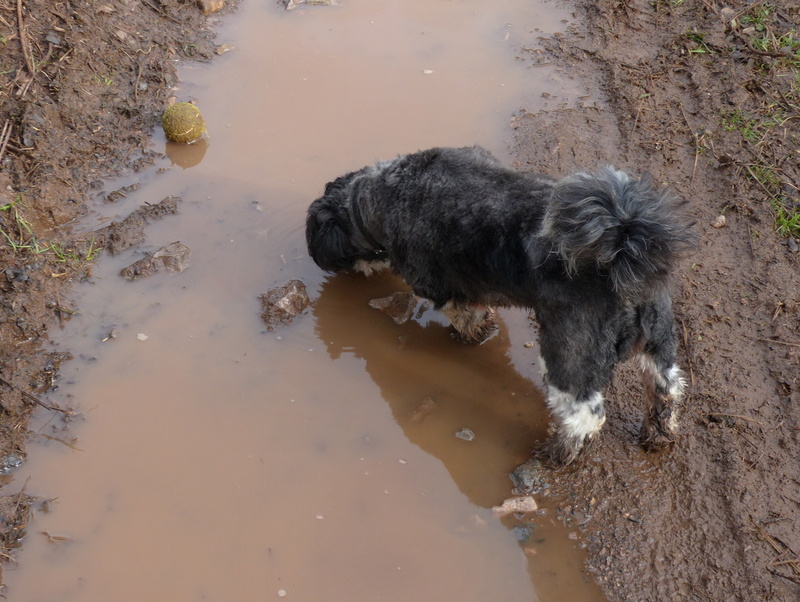 I did mean flowers, but I’m OK with ‘glowers’, Straight to the mud, you have to love Fizz. That’s so cute that you managed to keep her clean for a whole hour, cos that girl does like her mud. Your flower info is always great. But I really liked your videos today, the sheep coming over but probably most of all….your little robin eating from your hand! You are a patient nature lover. Thank you Sarasin 🙂 That patience is going to pay off. I have fed the Robin five times this morning and each time he has lit on my hand. I still have to get on my knees but he gets braver every day. More trust is building then from your patience. Soon he will sit longer. It must be a great feeling for him to be on your hand for even a short time. Just always amazed by your botanical detail and the dog. I must try harder as there are some ting types of vetch out but have to identify. Agree you do a great job. Really enjoyed the robin. You are doing very well with him. Your robin diplomacy is coming along well. Thank you for showing us some of it! 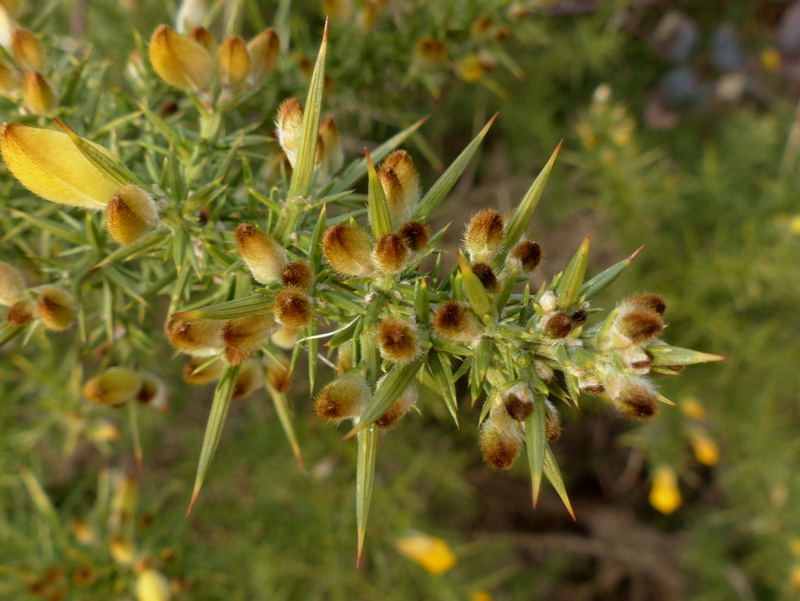 I enjoyed seeing gorse. 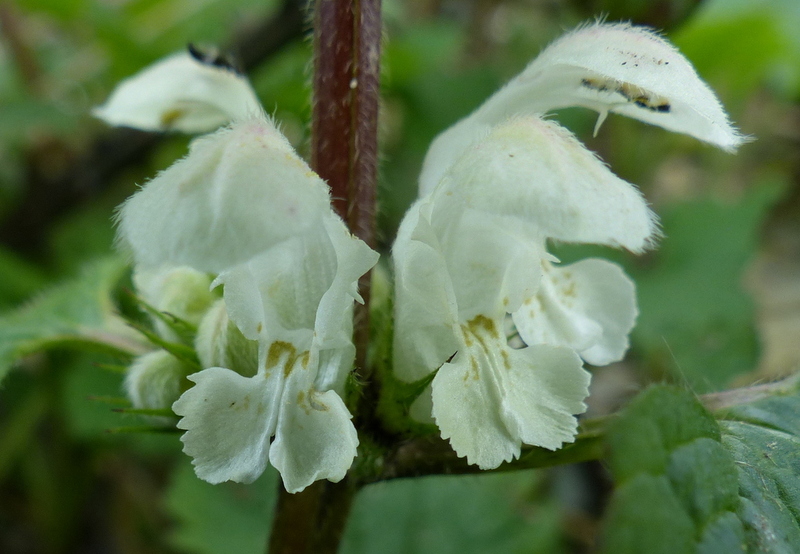 And that dead nettle plant- have you noticed the flower with those dark parts looks a bit like a spider’s face? The dark parts look like the larger sets of eyes, if you can believe that. Here we are getting another six inches of snow. We have finally gotten above freezing. 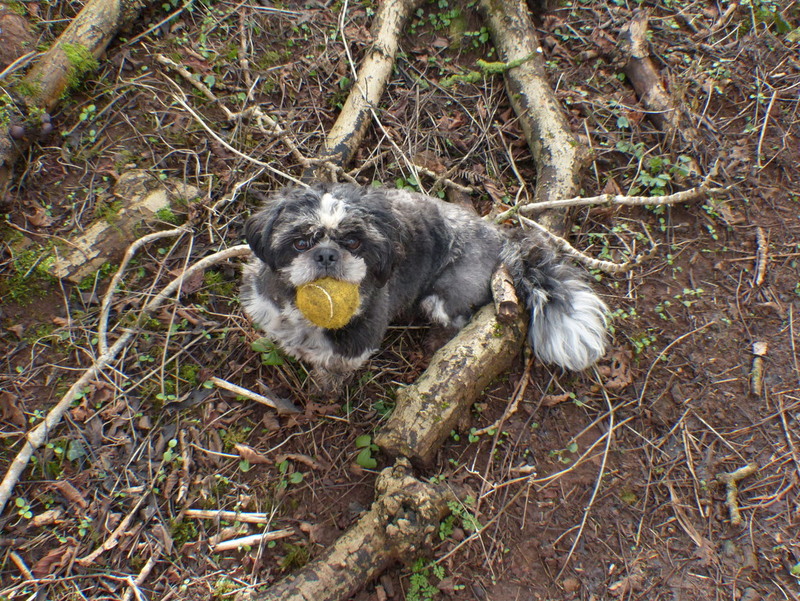 I plan on trekking up to my woods for some apple twigs for our pet rabbit. He’ll love a fresh batch, it’s been so long since he had a good solid branch to chew on. The things we do for our animal friends! Take good care and thanks for all you share. Thank you Lora 🙂 I am pleased to hear that Ramon is getting apple twigs, they actually sound delicious. Loved the sheep video – you have some black sheep in the family. Fizz looked rather intimidated. 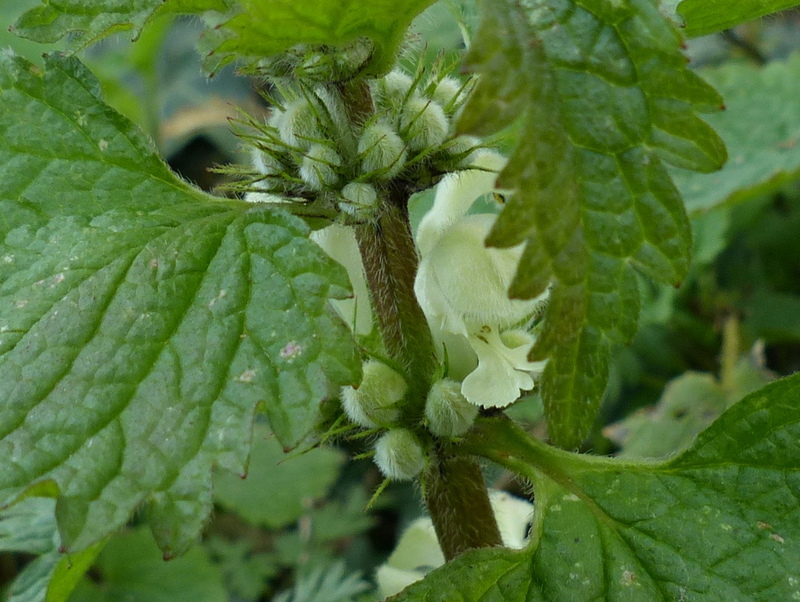 I never realised that dead nettles have square stems. Who’d have thunk it? Thank you Andrew 🙂 I am looking forward to seeing what you do with your garden, especially the results from the trail cam and moth trap. Did I not tell you that perhaps one day the sweet bird would eat from your hand. There is something magical between you, Fizz, the sheep and now the robin. Perhaps another robin will join him. You have a way with the “beasties” as you refer to them. I enjoyed the videos. Thank you Ettel 🙂 I am hoping that one day a whole family of Robins will join him. That would be fantastic. I always enjoy reading your comments, thank you. 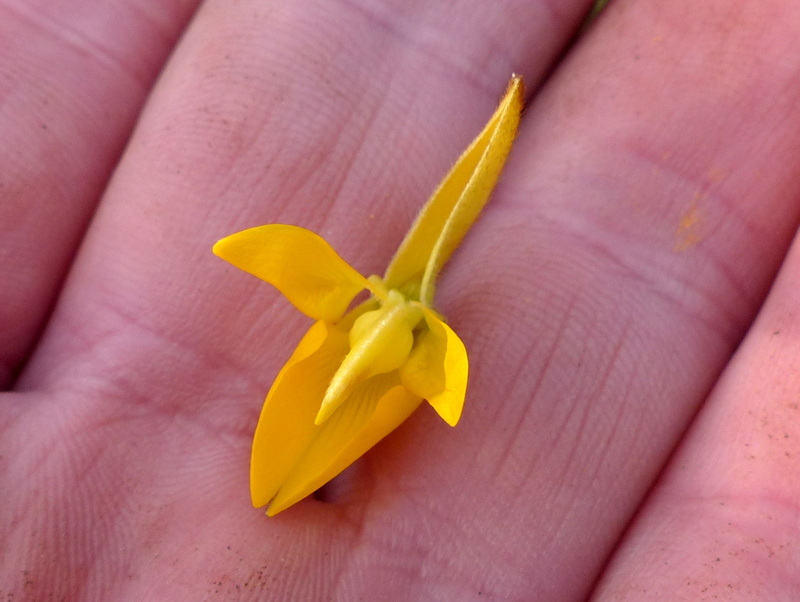 Your photos reveal how beautiful this common flower is when you look closely. Awesome Robin videos! In the sheep video, Fizz’s front and back look so much alike, I thought he was walking backwards. I would call in our sheep by hitting on a feed bucket… they’d come running so fast I had to get out of the way or they would have knocked me down. They were a party-crashing lot! Thank you Joy 🙂 Our sheep respond well to the feed bucket but we still have to go and find them, the fields are a bit big. 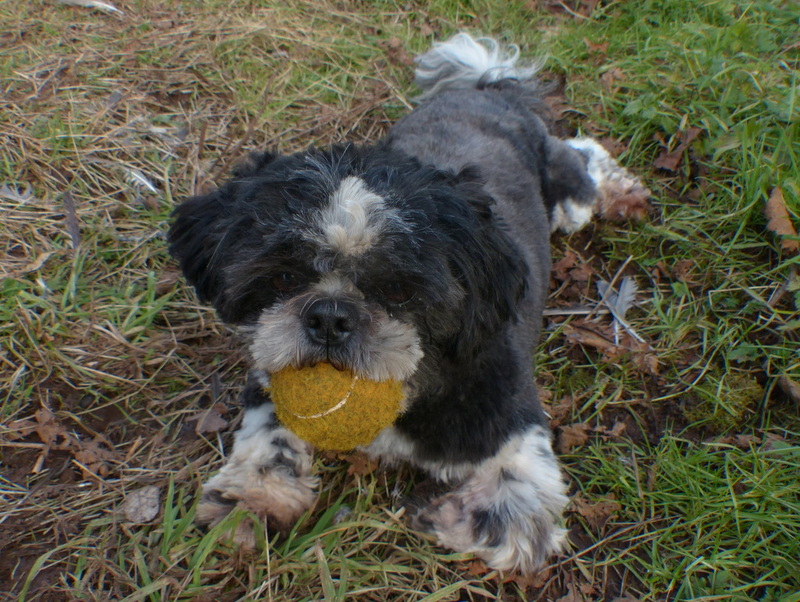 I know exactly what you mean about Fizz, when I first met her I wasn’t sure which end to pat and which end to kick. It doesn’t really make much difference which end I talk to, she still does whatever she wants, regardless. 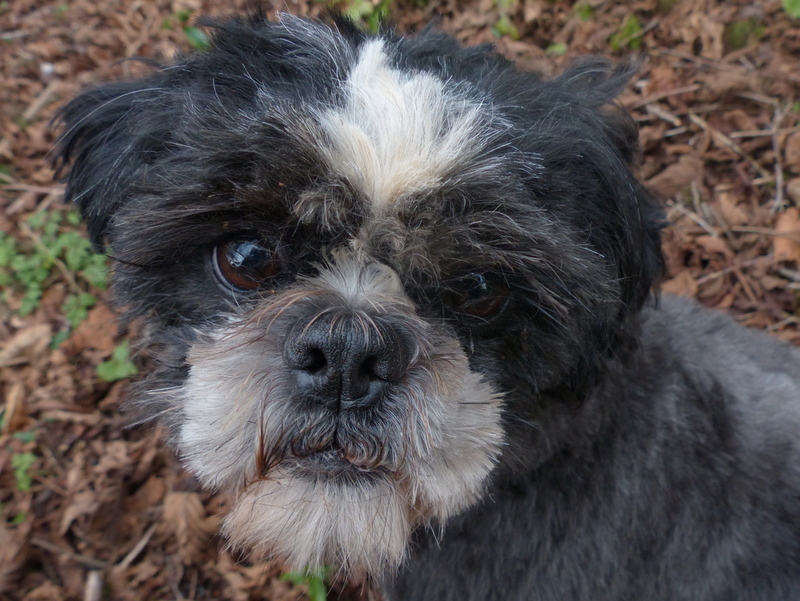 Now that Fizz’s character is well-known to us, I giggle to see her fresh from the beauty parlor all trim and neat. Not her style at all! Love the robin and sheep videos – my cat liked the robin, especially. 😉 She is an indoor kitty, so it is almost as good as the real thing. Your training is impressive, coming along well. I hope he does have a family – how fun to have a whole brood visiting for lunch. When do the swallows return? It must be soon, eh? Thank you Eliza 🙂 The first Swallow photographs that I took were on April 14th but they started to arrive about a week before that. It took them the best part of three moths to fly down to South Africa so I expect they are well on their way by now. I always used to think of Swallows spending the summer in the UK and winter in SA but in fact five or six months of their year is spent travelling. They are here for about five months so that doesn’t leave them long in South Africa. I can’t imagine what it takes to do that year after year. And why do they go so far when they could perhaps winter on the Nile instead? Wild life is so endlessly amazing to me. 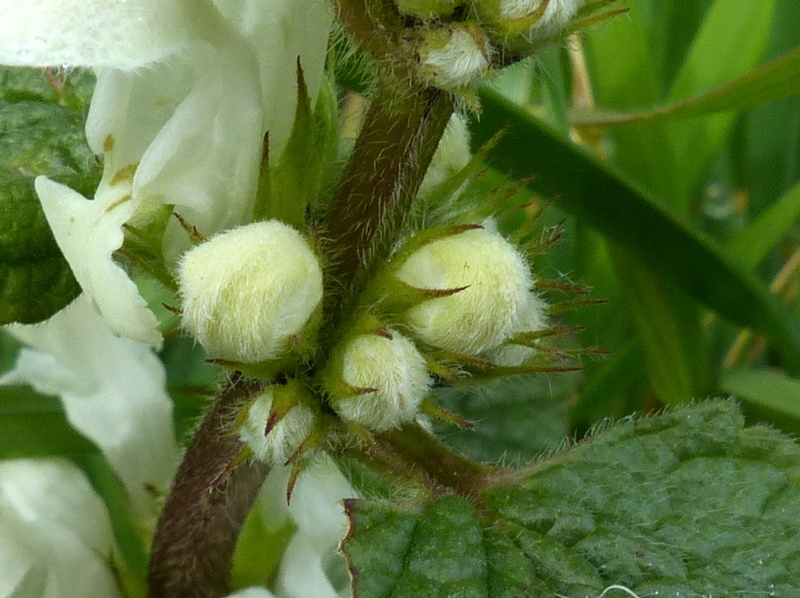 Lovely videos and detailed description of White Dead-nettle. I look forward to the Gorse post. Thank-you, Colin. A great show! I enjoyed the videos–sheep looking like part of the family, and the robin you’ve befriended. 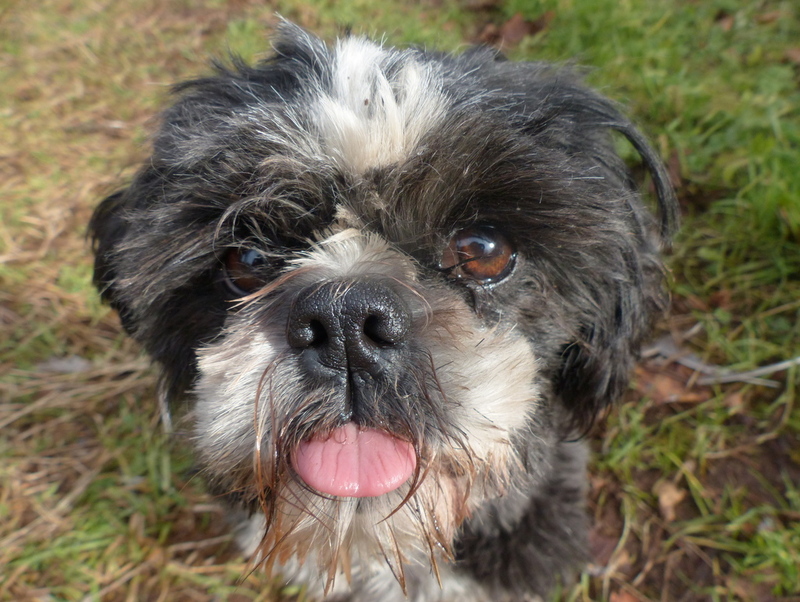 I agree–you have a way with animals–including Fizz. Also with showing and describing the details of plants and flowers–insects, too. Thanks so much. I love this blog and getting these snapshots of your life! You should be renamed the Bird Whisperer! Thank you Keira 🙂 Gorgeous is muddy now. It has been raining for the last two days and she still wants to go out! Although the male and female Robin appear identical (to us) just prior to the breeding season (about now) females are usually slightly bigger than males. Although some mothers are bigger than others :0) This is to give them the additional energy required for egg production. Loved the part about sheepdogs. 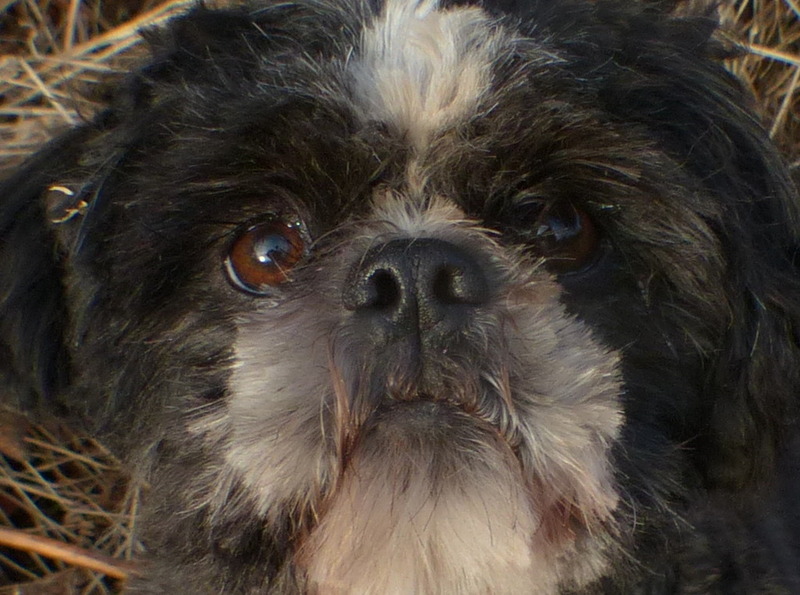 My shih tzu looked in a mirror one day and thought she saw a collie, and she’s been trying to chase sheep ever since. We’ve had several serious talks about it, but I haven’t managed to convince her that this is a Very Bad Idea. At the moment, I’m trying dog biscuits: We see a sheep, she gets a biscuit, therefore I am more interesting that the sheep. Works well. As long as she’s on a leash.